This is a beautiful moment from the book ‘The Viral Loop’ when James Hong and Jim Young realize they have a viral product in their hands. Hong is afraid that his father will find out the reason he’s spending a lot of time on the computer. However, when his dad sees the pictures on his son’s website — HotorNot.com — he’s hooked. In all probability Ben Silbermann knew that his website was a viral product. It was just a matter of time. HotOrNot is just one example of what great web design and engaging content can do with an audience. In this article we are looking at Pinterest. In my previous article, I spoke about Tumblr and it’s ability to keep a user engaged with new discoveries popping in his face. Pinterest, is more categorized in that sense. Pinterest is a social bookmarking tool that helps users to ‘pin’ stuff they think is awesome onto ‘boards’. Users create boards to organize stuff they like. The display for each user account looks like an array of boards with their ‘repinned’ items as contents. To me, it’s like a candy store where one can create an array of wonderful things. When I showed the user account to a friend she said that it looked like an organized wishlist. Imagine having separate Tumblrs dedicated to separate categories that you follow. Bit too much right? Tumblr is more about tags and Pinterest is about boards. In my previous article I spoke about Tumblrs supporting all kinds of content. On Pinterest, all your favourite things appear as items on the board. That doesn’t mean that a user can share and upload just visual content. There is room for creativity on the platform. Even though the content that appears as a pin is visual, one can embed links, text and price in the description as long as there is an image. 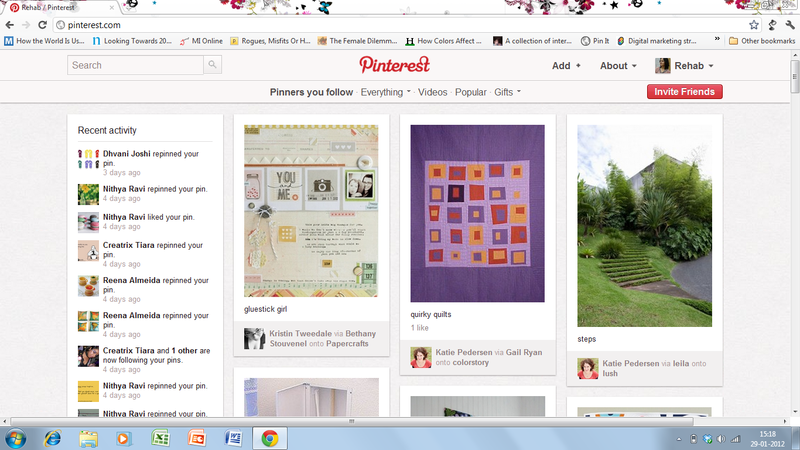 Pinterest is being discovered out of curiosity so I expect that the creators will allow different formats to flourish. Time Magazine has done a fabulous job of uploading relevant content with links in place. They are using the platform’s core capabilities and serving links to the users in the process. Pinterest allows you to link the photograph to the original source and this makes it easy for people to go to the original source of the image. Why is Pinterest such a rage? Pinterest seeks engagement. It’s designed in such a way that every ‘pin’ ( the word for an item on the website) can be added to a classification. The ease of ‘repinning’ and organizing the ‘pin’ in three simple steps is a key factor in keeping viewers on the site. True to it’s form, users who login to Pinterest are known to spend hours on it! There is so much gorgeousness on the web that you want to share! With a bookmarklet that pins every image to your personal board, it is easy to get addicted. The fun also begins when you don’t realize that you are repinning a brand. Zara hasn’t utilised the platform to showcase its collections but when fans repin the products they don’t realize that they are promoting the brand. The brand wins because of its ability to generate visual content and the user wins because they found the content ‘first’. Repinning, reblogging and sharing is about the ability to find and share the best content in the information mass. If you find the content ‘first’ you get the highest repins and are known as an intelligent curator. Use the repin bookmarklet to ‘pin’ anything on the web. You can create boards and classify it under any format. One of my favourite pinterest users is the co-founder of the website – Ben Silbermann. He has curated some interesting boards on his profile. However, articles with just text cannot be repinned.When I tried ‘pinning’ this article I got an error message saying ‘ Sorry, we can’t see any big images or videos on this page’. So if you want to ‘repin’ large amounts of text, it must be accompanied with images or videos. How do you use Pinterest for your brand? All pins on Pinterest lead to the original source. Since it is visual in nature you can share an image/video and a subsequent article with the ‘pin’. It is important that the image used to share the article or quote is unique. The beautiful thing about Pinterest is that it has so much unique stuff filtered into different categories. Users who used bookmarks to ‘like’ stuff, have a board to organize things. It’s like your own unique wishlist as per category. If you have a store on Etsy, you are better off sharing your products on Pinterest. Indian businesses dealing in unique products could use the medium to showcase their product line. Photography enthusiasts could share their work as a board. However, the Pinterest Etiquette does not encourage self promotion. Pinterest fans will vouch for this and it looks negatively on a user if content is continuously leading to a user’s website. The content that is currently on the website is an individually curated board. Any Pinterest user is interested in repinning unique content. It adds to the user’s ability to find and organize unusual stuff. Traditional services or brands that aren’t generating content would not find the platform useful. If my prime motivation as a user is to find and repin ‘interesting’ content, I will only look for ‘wow’. For now, the platform is yet to take off in India. It is still in the invite-only stage. I wonder if Pinterest is a more intelligent version of Tumblr. A platform that relies on its ability to create content worth sharing will never run out of content. But probably, it will run out of steam. If I find that the only reason I am logging onto Pinterest is to wow myself or to share stuff, I might get bored easily. How the creators keep the audience addicted and involved is a thing to be watched out for.